It will be a gentle walk on flat ground. Hidden Valley 104 West Carmel Valley Rd. CANCELLED: The Svyati Duo, with regret, has cancelled their Oct. 24 organ and cello performance at St. Dunstan's Church in Carmel Valley because of illness. They hope to return at a future date. This noted duo from the United Kingdom will be making a stop at St. Dunstan's during their U.S. tour. Do not miss the opportunity to experience this exquisite pairing of organ and cello! tone and color, rhythmic control, superb intonation and musical sensitivity. St. Dunstan's is located at 28005 Robinson Canyon Road, Carmel CA 93923. Details and directions at stdcv.org. Effective 6 pm, October 16, 2018, the Division 5 representative to the Monterey Peninsula Water Management District Board of Directors has resigned. The Board of Directors is scheduled to fill the vacancy by appointment at its regular monthly meeting on November 19, 2018, at 7 pm, 5 Harris Court, Bldg. G, Monterey, CA. The Board requests that individuals interested in representing Division 5 submit letters of nomination and statements of qualifications to the Water Management District office by 5 pm on Wednesday, October 31, 2018. Note: District 5 includes Carmel Valley and Carmel. The Carmel Valley Branch Library of Monterey County Free Libraries (MCFL) will be hosting the second Carmel Valley Traffic Safety Forum on Saturday, October 20, 2018 from 10:15 AM to 11:15 AM. Librarian and Branch Manager Eddy Hamelin will be the moderator for this important community event. The forum panel will consist of Mary Adams, Monterey County District Five Supervisor; Grant Leonard, Associate Transportation Planner from Transportation Agency of Monterey County (TAMC); Karolyn Stone from the Carmel Valley Village Improvement Committee; and Joseph Hertlein from the Carmel Valley Road Advisory Committee. The event is free and open to the public. This forum will be an open discussion, between local organizations and citizens, on traffic safety and related issues concerning Carmel Valley Road. Seating is limited, but reservations are not required. Light refreshments will be served. This event is part of Monterey County Free Libraries' mission to bring ideas, inspiration, information and enjoyment to our community. For more information, please call Librarian Eddy Hamelin, Branch Manager of the Carmel Valley Branch Library, at 831-659-2377. The Resource Management Agency of Monterey County announced that it has launched a 24/7 hotline to collect complaints related to public nuisances resulting from short-term rental activity in the unincorporated areas of Monterey County. "We launched the complaint hotline to better understand the community's nuisance concerns about short-term rentals," said Chief Building Official Neville Pereira. "As we work to develop a better policy solution to this important issue, we want to be in touch with the community on all sides." "Our policy must be enforceable," added Pereira. "The hotline gives us a way of taking code enforcement into consideration and gives the community a chance to be heard." The short term rental hotline offers two reporting options, by telephone at (831) 900-4441, or by an online form at https://hostcompliance.com/tips. Foothill Partners is proposing to build a commercial retail development on approximately 3.8 acres of land located at 3705 Rio Road within the County of Monterey's Carmel Valley Master Plan Area in unincorporated Monterey County, California. The retail development would consist of four commercial retail buildings, including a maximum 23,000 square foot convenience market/grocery store and three smaller buildings ranging from approximately 5,000 to 8,335 square feet. The development would additionally include two commercial retail farm sheds of 250 square foot each. In total, the project would involve the construction of 42,310 square feet of commercial space, and the building footprint of all buildings would occupy 26 percent of the 164,421 square-foot site. In January 2018 Hilltop Ranch sued the county, claiming that opponents (including CVA) waited too long to contest the administrator's interpretation and that neither the county supervisors nor the county planning commissioners had jurisdiction to hear the matter. 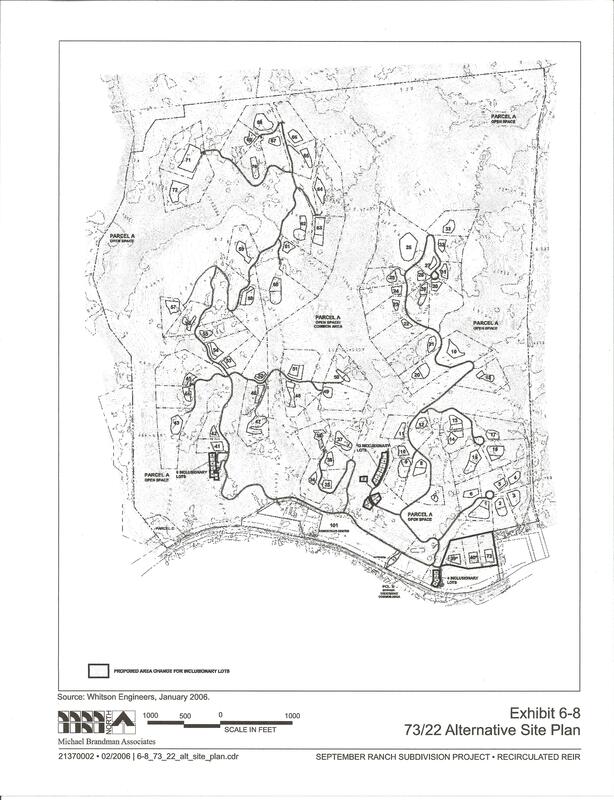 Hilltop Ranch withdrew its petition (its initial legal pleading) after the county objected. Hilltop Ranch then filed an amended petition. The county again objected. On July 11, the Superior Court heard oral arguments on the county's demurrer and motion to strike Hilltop Ranch's amended petition. The court sustained the county's demurrer with leave to amend. This means Hilltop Ranch got another opportunity to attempt to frame its legal claims in a new amended document. In August, Hilltop Ranch filed a third version of its initial pleading with the court. In it Hilltop Ranch again argues that the county planning director's "interpretation" became final for all purposes ten days after it was issued - even though the planning director gave it only to Hilltop Ranch, and not to anybody else. On April 24, 2018, the court issued its statement of decision in Petitioner Carmel Valley Association's favor. As a consequence of the court's decision, the County of Monterey must set aside its approvals of the subdivision, including the County's certification of the Environmental Impact Report (EIR). The Carmel Valley Association prevailed on the California Environmental Quality Act (CEQA) and affordable housing. The developer can appeal, restart the process with new documents, or abandon the project. We understand the the developer has begun work on a revised Environmental Impact Report.